and her mother, Isabella Slimmons/Isabella Slemins/Isabella Sleaman and possibly Bella, daughter of John [pending research]. William S Taylor, "United States Census, 1870"
1870 Census has William 39, Eliza J. 37 NY, Anna 16, Caroline 14, William H. [Henry Taylor] 2, John h. McNeal 23, possibly related to Eliza. Anna F. TAYLOR married Benjamin Everett Ballard on 12 Aug 1874 . Roy now believes Ryans info is incorrect for the husband (if this is the case, cite Ryan's info). Unless two Anna Taylors married a Ballard on the exact same day in the exact same county. His citations did help with Anna and Everett. Need to see where the first citation came from. I have most of this already. The key to finding the grave marker (*see below*) and *Appleton* was the middle initial "F" and the dates for Anna. In Caroline Taylor's diary excerpt, her sister is listed as Annie and Anna. Anna F. Taylor (1854-1894) was Carrie and Susie's eldest sister. She lived in Michigan and was married to Benjamin Everett Ballard (1846-1917). Her son Henry Everett Ballard (1876-1854),  We still have very little on Anna. No letters that Roy is aware of, no photos, no history. Roy has uncovered that Anna's grandson, Edward Otis Ballard died in 1985 in San Diego, Calif.
University of Iceland has many of Anna Ballard's letters to her sister, Susie Briem! There is no known photo of Anna, or Elizabeth. Ones of Jane and Susie are in a Private collection. Could the following be "our" Anna Taylor? A source I cannot reveal mentioned the Visalia-Times and Henry. to a more centralized and safer location in the interior of the state. Many were concerned about Detroit's close proximity to British-controlled Canada, which had captured Detroit in the War of 1812. From Prof. Ryan Eyford's transcriptions. "Anna and Everett are in Lansing [Michigan]. Everett follows the occupation of his father on the old farm which is now within the city. "Lizzie [Elizabeth Mehetabel TAYLOR Carpenter (3)] went last fall at fair time and paid Anna a week's visit. Recently our fabulous cousin in Iceland photographed MANY of our family letters in the Icelandic Archives, in the Briem collection. I covered this in detail back when I discovered a PDF file listing the thousand+ letters. Yes, many are from within the Briem family, however, most were sent to Susie TAYLOR Briem or her husband; Halldor. The letters have been shared with any family members having interest. They have ones from John, Susie's siblings, nephews, John's cousins in Ontario, and GGF Sigurdur. Some have been transcribed, yet it all remains the "PROPERTY" of the Archives. My initial inquiry into them went unanswered. OK, so they are busy, SO AM I! Johanna spent a great deal of time and effort sending high resolution images of a portion of these letters. If someone wants to pay my way, I'll go over and photograph each and everyone over course of a week or so. In five years, I vow I will do so. If I had the money, I would sue them for all of our immediate family letters and photos, and let them keep digital copies.. Personally, I think they should be returned to our family. Each sibling of Caroline has living descendants. But no, they will keep them in some boxes deep in their recesses. That is why I nicknamed them 'Dark Forces'. Because many are of a highly private nature, they will not be placed here online. However, to me, nothing gets us closer to past family & relatives than Photos of them, or letters. Anna's letters are without a doubt the most interesting. Great aunt Veiga has the most eloquent wrtting of anyone in the families. Next goal is to get everyone of John Taylor's letters, and find his siblings descendants; Marys?, Carolines, and Elizabeth (1). Thanks to our Barbadian relative, unlocking the mystery of The Jones, Leslies, and Taylors is just a matter of time. Photos and more information for public display here on Susie appreciated. Very cool, I will be at this grave July 21, 2014, in person, to photograph it. The Hope Cemetery is very close to where Caroline was travelling from Lansing where their father, William Stewart Taylor was farming 1875. Have not had interaction with the Ballard Family (current generation). Hope to establish visit while in Lansing, if any family are still there! Update: In touch with Anna's husbands family. They have nothing on Anna, and unaware of her before I put this all together. Update: In contact with Florence. Appleton grave at findagrave. Some guy named Ed Houghtaling controls Anna's memorial. Do not waste time on that. I have our own memorial of Anna TAYLOR Ballard right here. the current generation do not go beyond one email response. Still, I believe "to ensure our future generations do not lose track of their roots, we need to plow those virtual fields now and see what comes up." After reading The Hearn Family Story, I now believe all my previous information was incorrect. Mary Hearn states Anna (Sister of Caroline TAYLOR) was married to an Everett, homesteaded in NO. Michigan, son Henry Ballard, he had 4 children..
Part of the Sig & Hank Christopherson Collection, probably that this is either family or friend of the family. Roy feels she is directly related. Could this be a photo of one of Caroline's sister? She does not show in any other photo. Perhaps and expert could date this photo. Ironically, I had the death date above the whole time. Luckily Sue photographed the stone marker. Very odd that they were not buried together. Since Anna passed away young, that is probably why. To visit, go to findagrave. Kohlerlawn Cemetery, 76 6th St N Nampa Canyon County Idaho USA Postal Code: 83687. About 350 miles SE of Portland, where the Laphams lived. Even includes CERTIFICATE OF DEATH which does NOT list an spouse other than he was a Widow. Bright's disease is a historical classification of kidney diseases that would be described in modern medicine as acute or chronic nephritis. it is affected by deficiency of Vitamin or diet, and not something hereditary. So Anna dies 1894, age 40, obviously of some issue, and he died 1917 = 23 years since Anna had passed away. Did he remarry? Above Caroline Christopherson refers to him as Everett, not Benjanin, and here on his grave shows Everett as opposed to Benjamin. Found a whole generational web page done up by D La Pierre Ballard. At the time, I was not sure their Anna was ours. Note Ballard Street at end. Not sure if related to Appleton? Having such great luck, found B. Everett Ballard, "United States Census, 1880" at familysearch.org. Ancestry had 2 day open access on "some" records. Benjamin Everett Ballard, "Michigan, Marriages, 1868-1925"
29 Dec 2013), Benjamin Everett Ballard and Anna Taylor, 12 Aug 1874. "Anna TAYLOR and Everett BALLARD" and Michigan"
A ton of Taylors here! Anna being born abt 1850, this would put her at 24 and a possible match. Here is an image of their actual Marriage Record. Show 'F' as middle initial of William F. Stevenson. Although not standard F, it is an F.
Could Henry of had a sibling? Mary said Henry, son of the above was an only child. Here is the full tree. http://www.stgelais.com/gen/cann/f_3f.aspx#6 The main problem is Ballards first name here is Benjamin, NOT Everette. Ingham County, Michigan. Benjamin lived in Lansing, Michigan in 1899. Benjamin Everett Ballard, though too young to go into the army, was a host of help to his father during those war years. He died at the residence of his son Henry E. Ballard at Nampa, Idaho, December 17, 1917, aged 71 years. Anna was Benjamin's younger sister, L. Anna Ballard, M.D. which means there is no relationship with being named after "our" Anna Taylor. UPDATE: 12/29/2013: We have the right family! Stupid fuses. Had two small heaters going and now have to repaste the Anna findings. No PC Battery back-up! According to a confidential source this "possibly" might be our Anna Taylor. www.findagrave.com, Created by: Ed Houghtaling, See her grave marker here! Ballard, William E., b. 1904, d. 1916, s/o E.D. & D.M. And look who pops up again, it is Appleton. Roy will contact the Ballard family again, as it seems for sure we are related. "Benjamin Everett Ballard, though too young to go into the army, was a host of help to his father during those war years. L. Anna Ballard, the next in order of age, is living in Lansing." OK, let's get some certificated on Appleton Ballard cross-referencing Everett as his son. Click here to jump down to Appleton, Benjamin Everett Ballards father. Eventually this will make its way into a book. Part of the trip was through Lansing Michigan, once home to William S. and Isabelle Taylor. near it. It was been leveled and factories now cover the land. While the previous owner of the truck/camper basically lied about the camper, the truck was in relatively good shape and low mileage. Had I rented, it would have exceeded half the cost of the camper, which I still have. Probably near the Appleton Ballard Farm. Deaf3279 posted map and background on how Lansing came to be here. Good source on old maps. Hmm, looks like following are not his records. NOT OUR BENJAMIN! "...Benjamin Everett Ballard, though too young to go into the army, was a host of help to his father during those war years. He died at the residence of his son Henry E. Ballard at Nampa, Idaho, December 17, 1917, aged 71 years...."
Oddly we have a person of the same name. Could this be Anna's Benj., or someone else? Everett Ballard in entry for Henry Everett Ballard, "Michigan, Births, 1867-1902"
Everett Ballard in entry for Henry Everett Ballard, 22 Feb 1876. This would show Henry was married at one time before taking Steamer Tramp ships around the globe in the 1930's. B. E. Ballard in entry for Henry E. Ballard and Florence E. Merryman, "Michigan, Marriages, 1868-1925"
Witness: This is where Florence was born Missouri. Witness at your mom's side for the marriage was Ernesta von Baumbach. She was married 1907 in Santa Barbara. Google Book clipping on her Sometimes these are leads to other family. Image of the marriage record here. 1860 Census - Might be Johns family? Name: Ella W Merryman Event Type: Census Event Year: 1860 Event Place: District No 1, Buckingham, Virginia, United States Gender: Female Age: 16 Race: White Race (Original): [Blank] Birth Year (Estimated): 1844 Birthplace: Virginia Page: 57 Affiliate Name: The U.S. National Archives and Records Administration (NARA) Affiliate Publication Number: M653 Household Role Gender Age Birthplace John S Merryman M 47 Virginia Elizabeth Merryman F 37 Virginia Ella W Merryman F 16 Virginia Roberta Merryman F 14 Virginia Allis Merryman F 12 Virginia John Merryman M 10 Virginia Catherine Merryman F 9 Virginia Harriott Merryman F 8 Virginia Mary Merryman F 7 Virginia Charles Merryman M 5 Virginia Household ID: 418 , GS Film Number: 805337 , Digital Folder Number: 004297366 , Image Number: 00429 Citing this Record "United States Census, 1860," index, FamilySearch (https://familysearch.org/ark:/61903/1:1:M41S-L75 : accessed 24 May 2015), Ella W Merryman in household of John S Merryman, District No 1, Buckingham, Virginia, United States; from "1860 U.S. Federal Census - Population," database, Fold3.com (http://www.fold3.com : n.d.); citing p. 57, household ID 418, NARA microfilm publication M653 (Washington, D.C.: National Archives and Records Administration, n.d.); FHL microfilm 805,337. "United States Census, 1870," index and images, FamilySearch (https://familysearch.org/ark:/61903/1:1:M4X4-R3K : accessed 24 May 2015), John Merryman, Missouri, United States; citing p. 45, family , NARA microfilm publication M593 (Washington D.C.: National Archives and Records Administration, n.d.); FHL microfilm 552,261. All the last names differ. Looks like he was single working in a store. Thursday, 24 Apr 1890: In Memoriam. Died, in Cairo, Ill., April 14th, 1890, after a lingering illness, Emily Rathbun, wife of J. W. Merryman. Emily Merryman (born Rathburn) was born in 1852, at birth place, Wisconsin. Emily married John W. Merryman. John was born in 1843, in Illinois. Mary Ruth Stevenson (born Merryman) and one other child. September 19, 1842 — Lincoln refuses to reply to Shields' second note until Shields withdraws his first one, whereupon John D. Whiteside and Dr. E. H. Merryman, acting respectively for Shields and Lincoln, failing to reach an amicable agreement, propose a duel. September 20, 1842 — Back in Springfield Lincoln instructs Merryman as to the course to follow, and acting upon the advice of his friend, Albert T. Bledsoe, selects cavalry broadswords of the largest size as the weapons to be used. Then, fearing arrest, he leaves for Jacksonville. September 21, 1842 — Lincoln's friends Butler and Bledsoe with Merryman join him at Jacksonville, and having procured broadswords the party sets out for Alton. +"
Roy is working on the lineage from John W. Merryman back. the Merryman Project is now completed. Roy spent 2-4 weeks compiling info from the Internet, finsing Vital Records, and completed the Merryman and Price Family Trees, one leading to William I. On well known people, existing trees were used, and certification up the mai lineage was checked. Following thre links make up the trees. Document compiled by Roy from PIECES of the Maryland Hist Soc PDF. It was pieced together to prove one lineage out of the volume. Only on Merryman in this graveyard listed. Neither are listed at Findagrave. This unknown woman is possibly 17-20. Roy's guess is, she is from Emily RATHBUN Merrynans family. Yet there does seem to be a resemblance to Anna. Shape of face, hair style, mouth, ears, and even expresion of the eyes. There is no other known photo of Anna. Original of this photo on the left is unknown whereabouts. UPDATE: Response from Chicago - "It looks like Holmes to me, as well, but the photographer I found at that address in the Chicago City directories is Swan Holmer. This spelling is consistent through several directories, so not a typo on their part. He first appears as a photographer in the 1901 directory (he is at the same address in 1900, but occupation listed is carpenter). Swan Holmer, photographer, 1250 W. 63rd. In 1910, his address changed to 1148 W. 63rd (he didn't move, the street numbers in Chicago changed in October 1909). So, presumably this photo was taken between 1901 and 1909. Chicago History Museum Research Center/lm"
MANY, MANY thanks to the Research center for taking time to look into this! See a comparision below. Did the math. Left is 100% Anna, and right sure has a resemblance. Now Anna was born 1854. From this Obit we learn Ruth married a W.S. Stevenson, passed away same place as her mother, yet J.W Merryman was visiting." This would also confirm the 1900 census. 1940 Census Image. Interesting, this shows same name in Detroit but with wife and two children. Could there be two Alberts? Could he have remarried? 1890 CENSUS - Most burned up in fire. FINDAGRAVE listing Victor H. Merryman, his wife and son. Found same info on Ancestry. The Merrymans and Rathbuns match. Name: Victor H. Merryman with exact b./d, dates and places based on above. Victor married Pearl. Victor and Pearl had Reid Merryman. Their 2nd child was Lyle. Will have to look at what it takes to become a Professional Genealogist. Man, am I good! Google found this off this search parameter. No other matches came up for the two parents, nor leaving off middle Alpha. This would match her husband and place of Marriage. Seems her descendants might? high-speed, there sure were a lot of Daughters back then. Florence might have been a Chaplain too, as one entry showed it. Hold the Bus! Look who the parents were. Now either the person recording the place of birth in 1906 got it wrong, or the parents were wrong. Col Moses Robinson (Wiki) Moses Robinson (March 22, 1741 – May 26, 1813) mentioned above, who later became a Vermont Govenor and Senator..
A Bio in the Biographical Directory of the United States Congress, 1774-2005: The ... By United States. Congress, Andrew R. Dodge, Betty K. Koed, led me to an older Bio here. One item of interest is, he was stationed at Mt. Independence in Vermont Militia fighting against Yorkers, then the Crown. Moses is NOT related. Let us get back to Oliver. Stilll, helps to obtain more, as all we have is a Rank, and Vermont Militia, and possible separation before Mt. Independence. as Oliver Smith does not show up on Mt. Indepence Payroll . A Betsey Rood mentioned from Conn. Different husband, #676 on page 268? Oliver Smith, a Revolutionary War pensioner, was b.according to his pension records, Hadley, Hampshire Co, MA 1752. Marriage to Betsey Rood is recorded on the DAR application of Grace Walters Tracy. Watching Bill Paxton on Who are they? show, Roy realizes there is a detailed event probably on file with DAR done by Oliver Smith. and not mentioned, or the info below is a different Oliver, as the wife is different. Full text online, but not public here. DAR website was so convoluted, I gave up trying to research Oliver Smith there months ago. Watching Who Do You Think You Are (Lowe ep), spotted Lowe typing into a page; Ancestor Search, which I found under Library menu. Pretty silly to want a relative to be this hero or that hero (Lowe). One must start with parents and work backward to whoever it connects to, good or bad. On a sidenote, if these Celebrities view all these documents and do not request a copy of each, they are doing their families a disservice. Results: Service: VERMONT Rank: PRIVATE under Col Robinson. No need to buy the 2 Descendants list we already HAVE it for free. Since he was only a Private, doubt there are any stories there, unlike Officers which have more time to write, and aspirations. Born in Wisconsin, USA on 1842. Adelaide R married Samuel Howard Harbaugh and had 3 children. She passed away on 24 Jan 1923 in New Albany, Indiana, USA. This should be Florence's Aunt, as a lineage stops above Florence here. Roy's guess, it was her aunt that was probably a member if DAR that got Florence to become a member of DAR. Florence Ballard's Oliver Smith served under Moses Robinson as a Private during Revolutionary War. Betsey ROOD Smith was born Sept. 15, 1787. Report done on this lineage to a Hall. I was barking up the wrong tree for Oliver Smith. Ours in Hadley MASS, and not the Col. in Conn.! Mr. Hood mentioned the Pratt family was of interest. We have George Pratt married to Elizabeth's family here. Hmm, do not recall who Mr Hood was? Otis Ballard in household of Henry Ballard, "United States Census, 1920"
One of Henry's passenger list at age 60 in NY. Ship: Koenigstein. Another one at age 61 in New Orleans. Here he sailed in age 63 into Calif Ship: Tatuta Maru. DRAFT Military. Looks like Henry was drafted in Idaho 1917-1918 source. 1930 Census of Henry E. Ballard found Nov 29, 2014. By 1924, if the Beth Roy found was Henry's dau., she would have been married by 1924. Ruth was couple years younger. How could she not know about her? Phil who might of married this Beth died 1937, 13 years after they were married. Only solution is to find this Beth's Birth Cert, yet if adopted, she would not show as a Ballard, unless finding adoption papers. source This would confirm middle initial of Russel and Ruth, and two new members of the family, Everett (b. 1909), and Utis (b. 1916. Everett Clifton Ballard of Anchorage? Mike Christopherson was so kind in detouring 2 hours to take these photos for our family. just found the Beth based on a document Miriam Westereng sent (see image below). Actually Miriam's copy was probably a 4th or 5th generation Xerox copy, with most notation just blobs. Cousin Gary allowed me to copy 150 documents Hank had a long time ago, which is online. One set of pages is this 8 page family outline probably from Sig. and perhaps this is from them? Passed down to Keith Hearn. The following record confirms the names I had below! Florence would know if her mother Ruth had a sister. I believe the census is WRONG. Lousy Ancestry.com once again has locked up the census image. I believe Beth was someone else. Beth Ballard in household of Henry Ballard, "United States Census, 1920"
citing sheet 4A, family 511, NARA microfilm publication T625, FHL microfilm 1820290. If this is the same Beth? if born 1906 she would be 18 in 1924. Henry passed away in 1954, so why was he not at this wedding? Marriage Certificate for a Beth Ballard with mother named Florence E. Ballard. Amother clue to reserach is witness two, A.C. Faris, which shows below as Albert. How many Florence E. Ballards could be in Nampha? Philip Clark Faris, born 1901 Philip Clark Faris was born on month day 1901, to Alfred Campbell Faris and Martha Della Faris (born Tippin). Alfred was born on September 6 1868, in Clarinda, Page, IA. Martha was born on August 5 1873. Philip had 4 siblings: Albert Fred Faris and 3 other siblings. Philip passed away. Phil married Beth Faris [see above - Ballard]. Phil lived in 1937, at address, Idaho. Phil passed away on month day 1937, at age 36 at death place, Utah. He was buried at burial place, Idaho. what is the county for Nampa Idaho? The parents match above records. has lots of details. Also looking to this fellow born in Nampa, Idaho in 1926. 6 years after census above. Could he be related? Many family live 30 mins from me. Possible Beth did not live to adulthood, since Florence does not mention her? "I do remember him [Henry Ballard] but he was older and nothing to connect with. My other grandfather, Herman, lived in a one bedroom house which was built on the same property in the back....redacted. Update: Hope to add more here on Ruth. with a Servant; Ida A Siewert, F, 19, Michigan. and a grand daughter Florence, probably named after Florence Merryman. Henry & Florence Ballard, and, G. Grand dau. of Benj. Everett. & Anna TAYLOR Ballard! Found a Ruth Evelyn Ballard, no DOB died 1996 source. Ruth Ballard was born on _____ at ___. Died _____ at ____. Burial at sea. Roy located Ruth's daughter living on the east coast. Update: APR 14, 2015: Florence is sending photos of her grandparents Henry and Florence Ballard. How cool is that! Will ask if we could post and credit them here. Told Karol it was better than Christmas. My 2-3 years of putting all this together has reunited our Taylor families. and another of her GM Florence Ballard and baby carriage. With more information supplied by our newly found 3rd cousin, Florence, found more info on Ruth who died at Sea. This looks interesting because Charles last name is not readable in source above. Looking at an image of the census below, looks like his name is spelled with a p instead of a b. Yet if the census taker mispelled the name, this might be a match. Examining the actual image of the census, it is Charles Achterperg with a P, not a B! So all following info is wrong or census taker wrote it wrong. Census Bureau's designation of the Visalia-Porterville Metropolitan Area. Could this be Ruth's husband? Cool, think I found them based on a Herman from census above. paternal GM was Karolina. Minni is Charles 2nd wife. George Emil is a son of Herman and Minnie source. In census above, states Charles was 50 yrs old in 1940 = b.1890, which would match above, and his wife born MI. Herman above might be his father, and son in census might be named after his GF? There is no Ruth Achterberg buried next to above Charles. Following does not appear to be related!!! Married to a Fred, not Charles, so this is a non-related. Ruth Ballard married a 2nd time to Frank Thias. Could this be him? FRANK THIAS	redacted	June 1, 1898	August 15, 1987,	89 years	CA	95688 (Vacaville, Solano County)? 1ba. Florence Daughter of Ruth Ballard Achterberg and Charles. This comes back to Mother being a Ballard. Found public records with Florence's address and PH matching the SEPT 12 birthdate. Wrote her a Snail Mail. Feb 22, she wrote back confirming I have the right florence, the only grand daughter of Henry & Florence Ballard. so deleting the records. Also sent FaceBook Friend request and email. Florence Carolyn Achterberg, born 1932 Florence Carolyn Achterberg was born on month day 1932, at birth place, California, to Ballard. Roy is mailing a letter to the FL address. UPDATE: Florence replied with a letter CONFIRMING she is the one I have been seeking! Florence Achterberg is now connected with Roy. Florence remembered Kay Christopherson, who had a big family. His backyard overlooked the Aptos Jr. High School. He was a cousin of her mother, Florence. Kay helped her parents find a rental home in San Francisco when they had to move because of the war, and his father could not work because of lack of parts. Charles went to work in the ship yards. Florence would stop by and visit Roy's grandparents on the way from school to home. She said Eileen had a "pretty voice"
She has no other records at Familysearch. There is same name in Sacramento in 2007. Address: 1150 Silver Ave Address Continued: San Francisco, California 94134 (MAP) At Silver & Dartmouth. Lydia M Ballard was born on Monday, April 27th, 1903 and died on Tuesday, October 13th, 1992 at the age of 89. An Everett Ballard of Santa Rosa...Related? Everett v Ballard (1908 - 1990) was born on October 12, 1908. He was born into the Ballard family. He died on December 28, 1990 at 82 years of age. Everett v Ballard's last known residence is at San Francisco, San Francisco County, California. A Ballard, Everett Number. Not much use. Burial: He does not show up in Visalia cemetery Search engine. Trying various spellings on both yields no more findings. It is a trip that Roy could have crossed paths with Edward in SF and not even known we were related. Do not believe Hank knew of him. Wish I knew he was in SF a couple years ago when I could have asked Hank. 3rd cousin Florence emailed saying he was buried in SSF with his wife. Let's see, Everett died in 1990 age 82, Lydia died 1992 age 89, so perhaps Mara was his 1st wife, not second? They are not buried at Woodlawn Memorial Park. Regarding Everett V. Ballard, Mara Ballard and Lydia M. Talley. I checked our records and unfortunately I wasn't able to locate any of the names you gave me. If you have any further information that you would like to provide feel free to respond via email or call the number listed below. Note Russell's middle initial as 'M'. This could give a lead. Born 1916 or May 19, 1915. Died 01 May 1985 San Diego, possibly Cardiff by the Sea (Wiki), San Diego County, California 92007.
accessed 29 Dec 2013), Henry Ballard in entry for Edward Otis Ballard and Luella Maher Mckim, 1949. Edward O Ballard, "California, Divorce Index, 1966-1984"
Edward Otis Ballard, "California, Death Index, 1940-1997"
"California, Death Index, 1940-1997," index, FamilySearch (https://familysearch.org/pal:/MM9.1.1/VGP9-HJ4 : accessed 29 Dec 2013), Edward Otis Ballard, 1985. Edward Otis Ballard, 1915-1985 Edward Otis Ballard was born on month day 1915, at birth place, Michigan, to Merryman. Daniel Otis Ballard, "United States Census, 1940" Wyoming Source If 1874 then not related. Edward Ballard 1915 - 1985 was a member of the Ballard family. Edward was born on May 19, 1915. Edward died on May 1985 at 69 years old. Center of Health Statistics, California Department of Health Services, Sacramento. The Empath in me tells me that this is the son of Georgett L. Wynne and _____ Wynne, which might make him step-son of Edward Otis Ballard? It appears he was in a few plays, TV and movies over course of a decade and perhaps dropped out changing careers, or met with an accident or something. B. Evart Ballard in entry for Ballard, "Michigan, Births, 1867-1902"
FamilySearch (https://familysearch.org/pal:/MM9.1.1/NQ4B-R5L : accessed 29 Dec 2013), B. Evart Ballard in entry for Ballard, 31 May 1882. Benj. Everett Ballard in entry for Ballard, "Michigan, Deaths and Burials, 1800-1995"
FamilySearch (https://familysearch.org/pal:/MM9.1.1/FHNT-F6V : accessed 29 Dec 2013), Benj. Everett Ballard in entry for Ballard, 10 Sep 1884. This record has image attached, yet less info. Wow, this must have been hard on them. www.Balcro.com has the best genealogy on the family. See section 26 on Ballard Family. Direct link. This one document along with all the other facts on this page connects the dots to Appleton. Appleton Ballard in entry for Benjamin Everett Ballard, "Idaho, Death Certificates, 1911-1937"
Appleton Ballard in entry for Benjamin Everett Ballard, 17 Dec 1917. Appleton BALLARD was born on month day 1809, at birth place, Vermont, to Frederick BALLARD and Sindenia Achsah BALLARD (born Everett). Daniel BALLARD, Lydia BALLARD and 7 other siblings. Appleton Ballard married Epiphene nee Ellenwood on month day 1830, at age 21 at marriage place, Vermont. Epiphene was born on September 9 1809, in Liverpool, Lunenberg, Nova Scotia, Canada. They had 10 children: James Allen BALLARD, Sindenia Achsah Topping (born BALLARD) and 8 other children. Sources: "The Fortunes of War" by Faye Kert, MA Thesis Carleton University (1986) and Under the Red Jack by C.H.J. Snider (1928). Another notable brother was DAVID E. BALLARD is [was] living retired at Washington, Kansas. "Carte de visite thumb print view of a young gentleman, Henry D. Ballard. He is wearing a dark suit, vest, and polka dot bow tie, and has a beard with no moustache. Possibly taken while on leave to marry Elizabeth Knapp. Henry D. Ballard was born January 8, 1839 (not 1842 as written on the back) in Sparta, Morrow County, Ohio. He moved with his parents, Mr. & Mrs. Appleton Ballard, to Lansing, Michigan in 1848. On October 15, 1861 he enlisted in Company B, 2nd Regiment Berdan’s U.S. Sharpshooters, at Lansing, MI. He gave his residence as Ingham County, MI. He was wounded in action on May 4, 1863 at the Battle of Chancellorsville, VA. After recouperating from his wound he was transferred to the 2nd Battalion, Veteran Reserve Corps (Invalid Corps) on February 15, 1864 and discharged on October 31, 1864. His copy of U.S. Infantry Tactics is in the Archives’ Rare Book Collection, Acc. # 1887, and possibly his rifle is in the collection. He received a pension for the wound recieved to the shoulder. He was married to Elizabeth G. Knapp in Oshkosh on December 29, 1864. The Ballard’s had two daughters: Ruby E. Balllard Alexander and Lora E. Ballard Germanson (a foster daughter). He owned a small farm in Algoma and was a market gardner. He died August 27, 1917. She died on October 22, 1917." "...Henry D. Ballard was born January 8, 1839 (not 1842 as written on the back) in Sparta, Morrow County, Ohio. He moved with his parents, Mr. & Mrs. Appleton Ballard, to Lansing, Michigan in 1848. On October 15, 1861 he enlisted in Company B, 2nd Regiment Berdan’s U.S. Sharpshooters, at Lansing, MI. He gave his residence as Ingham County, MI. ..."
Will Filed in Probate Court Is Marked By I'nuiuiil Condition of Absence of Any Claims. An Interesting sidelight upon the upright character and methodical busi-ness system of the late Henry D. Bai lard [Ballard], pioneer citizen and civil war veteran, who passed away at his home in this city August 27, is shown by his last will and testament, which has just been admitted to probate by the county court. In the first paragraph of this testamentary instrument, which was executed November 17, 1916. Mr. Ballard wrote "I desire to state for the benefit of my executrix that 1 have no debts, that the same are paid daily by me, that I can say that I owe no man anything." Mrs Ruby E. Alexander, daughter of the testator, was named in the will as executrix and she has been appointed as such by the court without being required to give bonds, as requested by the testator. Mr. Ballard directed that all of his 'property, real and personal should go to his wife. Mrs. Elizabeth G. Ballard. she to have the use and income thereof during her lifetime After her death what remains is to be assigned in accordance with the will to Mrs. Alexander and Mrs. Lora E. Germanson, a foster daughter of the deceased. New photo on way in! According to Karol Ballard, they took out an ad together. Roy found this. Thanks to this link from Karol, here is copy of the ad Digitized by Google. Nice Bio on Anna L Ballard, Benj. sister. Ernest Hemmingway b. 1910 > Father: Clarence Edmonds Hemingway b. 04 Sep 1871 at Oak Park, Illinois suicide, d. 06 Dec 1928 m. Grace Hall. Hmm, an unusual name. Look into earlier generation. Mothers name is same as our target. Maybe popular back in that time & place? His two daughters	with same first name were born 1882, Illinois, and 1907 in China Source. 3rd citation and better children's info here. to the Ballard family as B. Everett Ballard married our Anna F. Taylor. Still possible F Adelaide Berridge is related to the author, but not directly. Going deep down the Rabbit Hole! So deep, forgot lineage I sought. Roy contacted a Ruth Ballard who I thought was related. She confirmed she was not. In May, Roy sold his house and traveled 9,000 miles in search of cousins in June, July, and August. Along the way, photos of gravestones were taken. The trip was covered extensively at www.scottishviking.com. This was at the top of the page of the initial research for Anna and they are not related, that Roy knows of. by Ryan, nowhere does he have this data. Database online. Year: 1900; Census Place: Troy, Walworth, Wisconsin; Roll: T623_1821; Page: 7B; Enumeration District: 99. United States; citing sheet , family 158, NARA microfilm publication T623, FHL microfilm 1241821. 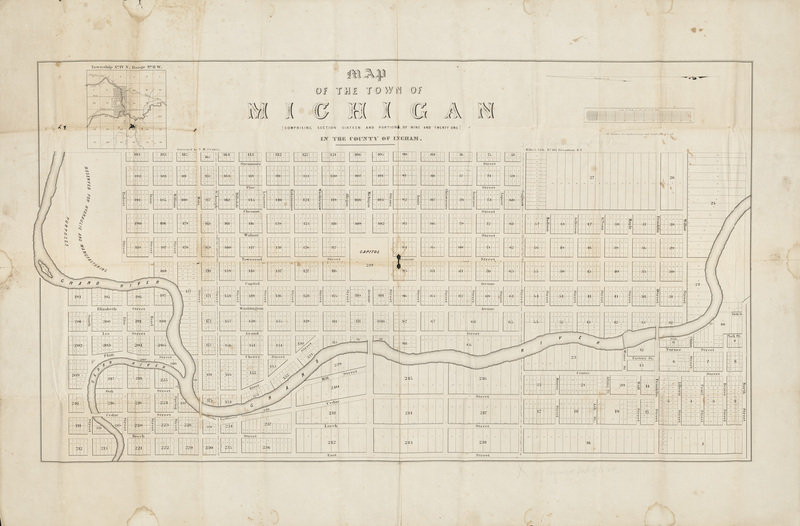 Early map of the Town of Michigan (Lansing). Original source here. McCracken, T. Map of the Town of Michigan: (Comprising Section Sixteen and Portions of Nine and Twenty One) in the County of Ingham. New York: Miller's Lith, 1847. In the process of redoing this map. He [Appleton and son] kept a store until it was burned, and after that he did market gardening near the capital city until his death in 1884. Roy added street names (Red), compass, and Ballard farm, and State Capitol. Left is the State Capitol. Right side Horizontal ST is Ballard ST.
Yellow indicates where the Ballard farmstead once stood. Top left shows Lansing today. Legend indicates border, houses now freeway. Middle layer map (blue outline) verifies street names. Plat of Appleton Ballards farm given or sold to Lansing, once called the Town of Michigan. RR through Ballard farm might have been removed, as there is path where nothing lies on it. Let us continue on the basis of Ryan's information. A 7 page document handwrites death of Williams son Richard as a child. This same person (Sig?) writes Anna had one son Henry, who had Ruth and sons. Ruth had Florence. Which means what Ryan has is incorrect. Cousins Tour 2014 revealed a census. Elizabeth is oldest, Anna is number 2. 1. drove to Mt. Hope Cemetery twice in search of Anna's grave. I FOUND them! She is a dead ringer for Anna Ballard, Anna Taylor's sister-In-Law. Note ear lobes, eyes, glasses, nose, Philtrum (above lips-valley), chin. Except for the Collumella (below tip of the nose, which is lower. This could be at earlier time when she had darker hair, and longer hair. Eye color could easily differ due to photographer's flash. Only issue is dress appears less victorian era? Dr. Anna in MI Hall of Fame. 2. Map of Anna TAYLOR Ballard (Caroline's sister), a Hiriam Ballard?, Dr. Anna Ballard; Anna's sister-in-law, Appleton, her father-in-law. Click to enlarge. The locations in yellow are aproximations. 3. Then went into the office Mon. for the index card for Dr. Anna Ballard's card. For some reason did not get good vibes, nor recall getting cards for others. Perhaps it was the 2-4 hr walk through the entire cemetery Sunday, as the office was closed, and the section sign for Anna was MISSING. So I went right instead of the left road from the entrance. Now anyone looking has an exact map. A Hiriam Ballard was along the left fence somewhere. Also found Taylors, Savage, Jones grave markers, yet no idea if related? Appleton Ballard was the child of Frederick Ballard born on 17 - Jul - 1780 at New London NH died at Sparta OH on 6 - Nov - 1868 and his ( 1st ) wife Achsah Everett born on 18 - Feb - 1784 at New London NH died at Sparta OH on 4 - Nov - 1857 married on - Feb - 1805 6. The Said Frederick Ballard was the child of Sherabiah Ballard born on 9 - May - 1745 at Andover MA died at New London NH on 29 - Sep - 1828 and his ( 1st ) wife Sarah Emerson born on 8 - Jul - 1746 at Norwich CT died at _______________ on - - 1811 married on 14 - Dec - 1771. The History op Holland, Mass.